On April 20, 2010, the Deepwater Horizon oil well drilling platform exploded, spilling millions of gallons of oil into the Gulf of Mexico. The spill is considered to be one of the worst environmental disasters in U.S. history, killing marine life and destroying entire habitats. Today, scientists continue to study the impact of the oil spill. 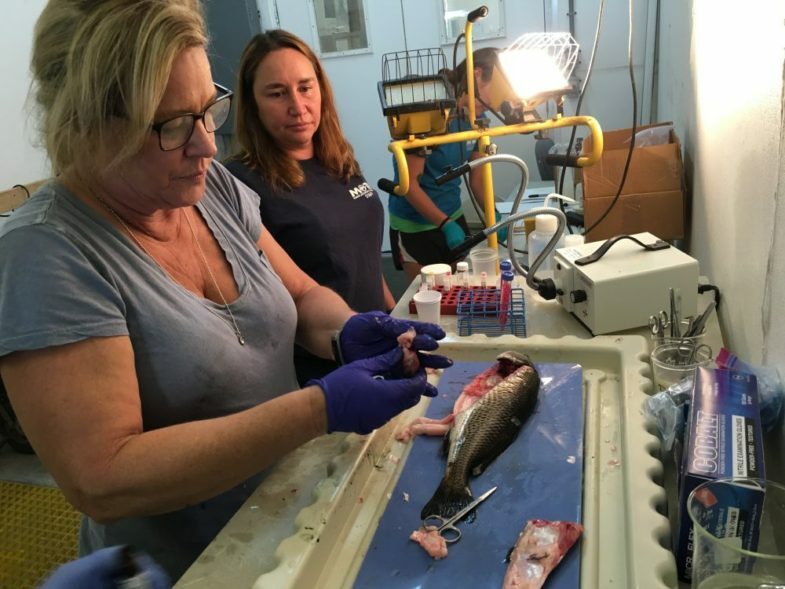 A team of scientists at the Mote Marine Laboratory in Sarasota, Florida, is raising adult fish and exposing them to oil, to find out how different species are affected by major spills. This piece aired nationally on NPR’s “Here and Now” on April 17, 2017. Marine biochemist Dana Wetzel (left) and a research assistant dissect fish that have been exposed to oil in the lab. This piece aired nationally on “Here and Now”, NPR’s newsmagazine program, on April 17, 2017.